Yesterday was the grand opening of our Bible Bucks store. I think all but 1 family was in attendance for this much anticipated event. 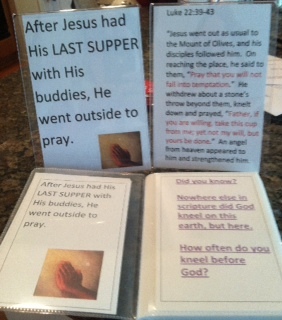 In cooperation with our 2013 theme from Mark 16:15, “Go into all the world and preach the good news to all creation,” Children’s Ministry began a Bible Bucks program to positively reward our students to encourage the use of their Bibles, “The Good News”. For instance, if Junior goes to Sunday School (1 from Sunday School teacher), brings his bible (1 from his Sunday School teacher), Mom brings her bible to church (1 from Ms DeDe), attends Children’s Church (1 buck) and brings his bible (1 from Ms. DeDe), Junior has earned 5 Bible Bucks for that Sunday morning. 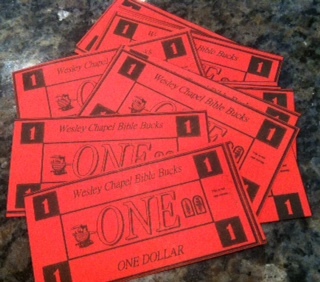 Bible Bucks remain at the church in each student’s file, located in the file box, placed in the breezeway next to the Sanctuary. 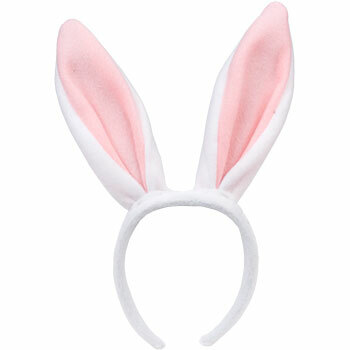 The congregation can get involved with our store by donating funds or toy items. They can also volunteer to help stock and run the store on a once a month basis. 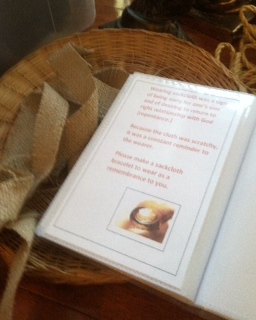 Borrowing a collection plate from the church office we situated a fine man of faith at a pulpit to collect the tithe. That was the first station in the hallway outside the Bible Bucks Store. Further down the hallway, a fine woman of faith was situated with a file box for the students to save 10% in the student’s mini file folder before entering the store. Youth and Dads guided the students in front of 5 tables, color coded with paper, with the greatest priced tables first in the door to lowest priced items at the exit. We had tables labeled with $25, $20, $10, $5, and $2. The toys (many were donated from a local grocery store when they needed to move their Christmas merchandise) were on the higher price range. The faith related stuff was on the lower end, because I want them to buy THAT stuff! Freebies I receive at conferences, trainings, along with fellow ministry friends who place huge orders and have leftovers, make up the lower-priced, faith-related items, along with office supplies. What kid doesn’t like office supplies? Our youth director picked up blue and pink bunny ear headbands to offer to any youth who “hopped in and helped” at the grand opening. Perfect incentive to involve the youth! Once the students paid for their items at the exit, they stopped back by the “saving lady” and re-deposited any unspent Bible Bucks to save until next month. The students who returned later in the day for other programs spoke highly of the Bible Bucks store and are already looking forward to next month. I got the template for the Bible Bucks at http://www.kidssundayschool.com/Main/Resources/BibleBucks/biblebucks.php and printed them on red card stock (just because that’s what we had the most of already in the office supply closet after all the Christmas printing was finished). Then, delivered a stack of the red Bible Bucks with the “guidelines” to each leader in all the KidMin programming areas. Goals (1) Kids getting used to bringing and using their own bibles, (2) Kids getting used to inviting others to everything, (3) Kids to begin financial habits that were biblical, (4) involve adults in a very infrequent entrance to service that may grow into something greater. Oh, and I’m not going to buy junk for the store. No outlay of precious funds when we all have basements and closets full of stuff (games, stuffed animals) that we don’t use anymore. 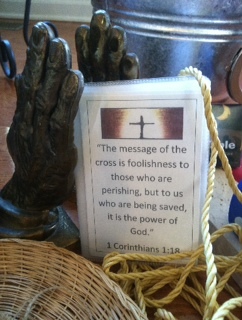 But we will place hand-made gift certificates for upcoming programming events and marketing items for the church. 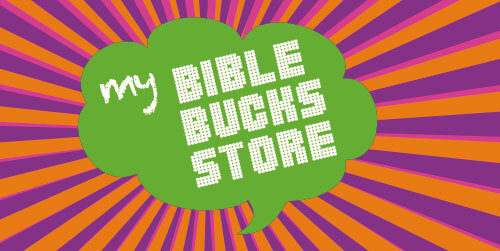 Any other ideas for a Bible Bucks Store? Faith sticks when little people can experience the family stories of the bible. The greatest story ever told is the Good News of Jesus. 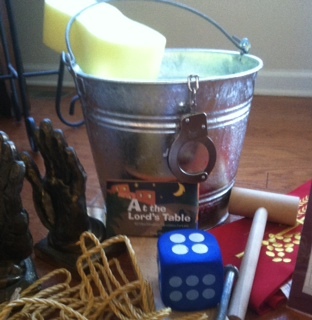 With Easter coming, we are preparing for a sticky faith formation experience for Palm Sunday’s Sunday school hour. 1. Jesus prayed in the Garden of Gethsemane. After Jesus had His LAST SUPPER with His buddies, and sang a song, He went out to pray. Did you know? Nowhere else in scripture did God kneel on this earth, but here. How often do you kneel before God? 2. Jesus was arrested in the Garden of Gethsemane. While Jesus was asking his buddies to “Watch and pray,” Judas, one of the 12, arrived. At once Judas came up to Jesus and kissed Jesus. Then a crowd came and arrested Jesus. Did you know? Jesus came back to his buddies to ask them to “Watch and Pray” 3 times. Do you have buddies you can ask to “Watch and Pray?” Pray that God will send them to you. 3. Jesus was taken to the religious leaders. The Meaners took Jesus to the chief priests, elders and teachers of the law looking for evidence against Jesus so they could put him to death. Did you know? The religious leaders were afraid of how the people loved Jesus. Are you afraid of people who love Jesus? 4. Jesus taken to the government leaders. Since the religious leaders were not allowed by law to put someone to death, they sent Jesus to the government leader to put Jesus to death. Did you know? Pilate wanted to let Jesus go and thought that having Jesus “spanked” would be enough punishment for the crowd. Do you let other people make you do things you know are wrong? 5. Pilate hands Jesus over to be beaten. Item: Crown of thorns and leather whip. 6. Pilate hands Jesus over to be crucified. John 19:16- “So the meaners took charge of Jesus. Carrying his own cross, Jesus went out to the place of the Skull (which is called Golgotha). Did you know? that the sickness of sin and selfishness is heavy? Do you really want to carry around something that separates you from God? 7. Simon helps Jesus carry the heavy cross. Item: Table mirror or cross kids can pick up and hoist onto their shoulders here, instead. Did you know? That someone helped Jesus carry His cross when it got too heavy? Would you help Jesus carry His cross? 8. Many of the ladies who loved Jesus followed him crying. Did you know? The term “Daughter” is a term of endearment for a family member. Jesus was claiming these ladies as part of his family. Do you claim Jesus as part of your family? 9. The Meaners take Jesus’ clothes. Did you know? It is a great insult to human dignity to rob a person of everything, even his clothing. Most of us will never know the shame and suffering of being penniless and virtually naked in a public place, as many of the homeless on the streets of our cities today. Have you offered anything to help clothe the people in our community? 10. Jesus is placed on the cross. Did you know? Jesus could have chosen not to take the pain and humiliation; he could have zapped those who mocked him – but he suffered through it all because he loved even his enemies. Does this even matter? Does Jesus matter to you? How? Did you know? From the very words of Jesus, it’ll take no longer than a day to get to heaven. Do you only pray to ask for Jesus to rescue you, bless you, protect you? Is it all about you? 12. Jesus asked for something to drink. Did you know? This vinegar was a cheap wine that the Roman soldiers drank while waiting for those crucified to die. Do you offer Jesus your whole life, the best of you (everyday prayer, bible reading, regular giving, and regular church attendance), or a cheap life (prayer only when you are in trouble, don’t use your bible at all, giving what’s left over, and choosing anything else over church attendance)? Did you know? Complete darkness covered the earth from noon until 3pm after Jesus died on the cross. All nature seemed to mourn over the stark tragedy of the death of God’s Son. Sunday matters because of what happened on Friday. Item: Heart-shaped stone, Resurrection Garden pot, a plant. Did you know? John 3:16 God loved . . . God gave . . . We believe and trust/ put our weight on it . . . We receive eternal life, new life, Christ life. What will you do now with what you know? Did you know? That God loves you so much, He sent his one and only Son, Jesus, to take the punishment for our sins (when we don’t love God and don’t love others) so that we can go to the big party in heaven one day when our time on earth is done. Jesus is preparing a place for all who love Him in Heaven. In the mean time, God wants us to talk like Jesus, and act like Jesus, by showing love to God and others. One way to do that is telling others the Good News that Jesus came to show us God’s love for us and others. Who will you tell this week? Another way to do that is to help someone in need. Who will you help today? You can place the information in plastic stand-up frames which can be placed at each station, or use a small, cheap photo book with the information if the stations are not in one location. Let me know of other ideas to keep the story fresh and new in the hearts of our families and in my own heart. 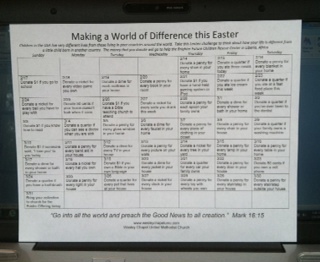 A good challenge each year is to discover something new about the Easter story to share with your little people. This IS the Good News…may we be found faithful in sharing it well and in a way that let’s little people and their families engage in conversation about our great Jesus. 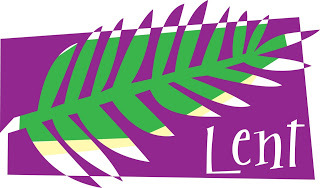 Lent, the period between Ash Wednesday and Easter Sunday, is a great time to make our little people aware of how children live around the world. We purchased some books to share with our little people to later place in our church’s library and we are handing out a penny donation lenten calendar to our families beginning this Sunday. This is the calendar…printed on a word document. 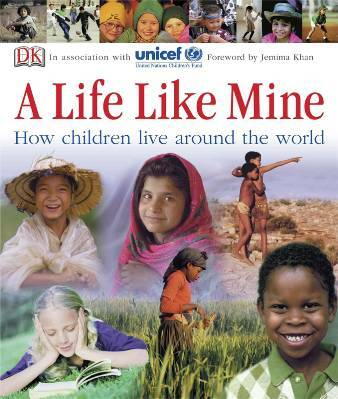 We chose a global ministry as the recipient found on the Advance UMC website that relates to children. These are the books we ordered to share with our students…. If you’d like me to email you a copy of the Word calendar document, just send me an email at dedereilly@comcast.net and I’ll get it right out to you.